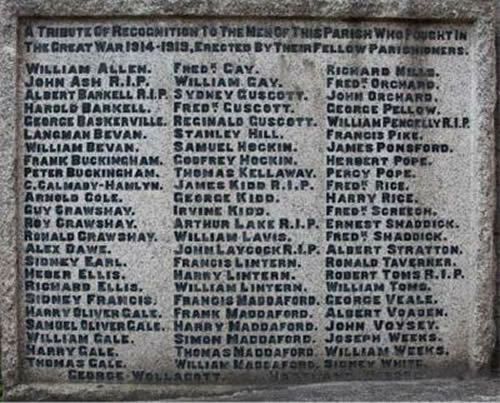 The names of all men from the parish who served their country in World War 1 are inscribed on a large stone which was set into the wall of the Chapel at the junction of Station Road and Fore Street. The path levels at the foot of the stone have changed since the original installation so the bottom two names - those of George Wollacott and Hartland Worden - are not easy to read. The names of the seven men who died are followed by the letters RIP. The Ash family farmed for many years at Way Barton in Bridestowe. John Ash was born in Peter Tavy in 1876 but his military record is not yet confirmed. 21130 Private Albert John Barkell of the 1st Battalion, the Royal Irish Regiment; originally enlisted in the Royal North Devon Hussars. Son of James Henry and Mary Ann Barkell (née Howard). Born in Bridestowe in the September Quarter of 1893. Died in the Egyptian campaign 17 December 1918 aged 25. D/19632 Sergeant Richard James Kidd of the 1st King's Dragoon Guards. Son of Colour Sergeant James Kidd and his wife Mary - when he retired Sgt. Kidd came to Bridestowe and set up a saddlery. Richard was born in Winkleigh in the March Quarter of 1888. Killed in action in India 16 May 1919 16 May 1919 aged 31. 7497 Private Arthur Charles Lake of the 1st Battalion, the Devonshire Regiment. Son of William Lake of Exmouth; husband of Minnie Lake (née Osborne). Born in Colaton Raleigh in the December Quarter of 1886. Died 9 May 1917 aged 31. Arthur Charles Lake was Bridestowe's Rural Postman. 41638 Private John Laycock of the 7th Battalion, the Royal Inniskilling Fusiliers. Son of John Thomas Laycock, one-time school master at Bratton Clovelly and his wife Eliza. Born in East Halton, Lincs, in the June Quarter of 1890. Died 16 August 1917 aged 27. 29919 Private William Henry Pengelly of the 13th Battalion, the Labour Corps, transferred to 835th Area Employment Company (96748). Son of the late Harry P. Pengelly of Lewdown; husband of Florence E Pengelly ("Flossie") (née Guscott). Born in Thrushelton in the June Quarter of 1876. Died 1 December 1918 aged 42. Buried in the churchyard at Bridestowe. 6144 Lance Corporal Robert Toms of the 6th Dragoons (the Inniskillings). Son of John and Dorcas Fry Toms (née Howe). Born in Bridestowe in the March Quarter of 1889. Died 12 August 1915 aged 27.